Alamat/Lokasi Kampung budaya sindangbarang ini terletak di desa pasir eurih kec. tamansari, kab. Bogor, Jawa Barat, Pulau Jawa, Indonesia. Jaraknya kurang lebih sekitar 5 km dari kota Bogor. Merupakan sebuah Kampung yang Tertua di Wilayah kota dan kab. Bogor, berdasarkan sumber dari naskah Pantun Bogor serta Babad Pajajaran. 1. Operasional Kampung Budaya, termasuk mengganti ongkos para pengurus, listrik, pelatihan kesenian,Perbaikan dan bangunan, Mendata Situs purbakala dan lain sebagainya. 2. Melakukan Revitalisasi kesenian tradisional Sunda, antara lain seperti Parebut Se'eng, Seni Gondang,Kendang Pencak, Angklung gubrag, Seni Reog, Rampak Gendang, Calung, Jaipong. 3. Untuk Pagelaran Seni Tradisi Adu jaten Parebut Se'eng ( Adu kekuatan merebutkan se'eng "penanak nasi", Lomba Tutunggulan , Seminar Budaya dan juga Kegiatan Upacara Adat Seren Taun. Address / Location Village culture Arco is located in the village of sand eurih district. tamansari, kab. Bogor, West Java, Java, Indonesia. The distance is approximately 5 km from the city of Bogor. Is a village in the oldest area of ​​the city and district. Bogor, based on the source of the text as well as Singapore Fashion Chronicle Ir. If, according to sources Fashion Bogor estimated Arco has existed since the era of the Kingdom of Sunda or less in the XII century. Here there used to be a kingdom named Subordinate capital of Arco and in Kutabarang. According to folklore, formerly trained here to become a place of royal knights. Here is also the beginning of a culture that has survived until Bogor today embodied in Seren Taun Ceremony. In the village there is a culture of Arco 8 kinds of arts users who have revitalized and preserved by its inhabitants. Here there are also many archaeological sites relic of a government database that hills terraces. In Arco on this annually held a ceremony Seren Taun ceremony is an expression of gratitude to the people of this village Almighty God for the harvest and crops raised in this and also hope that the results of the harvest in the next year will be better again. To maintain and preserve the traditional arts in the cultural village, it also organized dance training and dance aimed at young people free, young people who are already well versed in the arts of each will be included in a play for welcomes guests would also increase income for themselves. To preserve objects of historical and archaeological sites other, the cultural village is working with FIB UI in doing research, documentation and seminars related to the heritage sites of the government database. Folklore about Arco has also been tested and recorded by friends of FIB UI. Currently customs houses and cultural traditions in the cultural village of Arco has been reconstructed and revitalized with the guidance and instructions of Mr. Anis Djatisunda who is a Chairman of Arco and Culture of West Java. Revitalization of cultural and traditional houses was necessary to do so people do not lose his identity. Staying with the elder is one of the uniqueness of the cultural village of Arco. Because this is a cultural village and guests who visit will also feel the atmosphere of village life everyday. Guests will also live with elder and artist who lives in the village culture. Guests who come to visit will find the atmosphere of the mothers who were in shelters menumbug lisung rice, cooking still use firewood and ash (a traditional stove), see farmers who are farming, learning traditional arts and so forth. 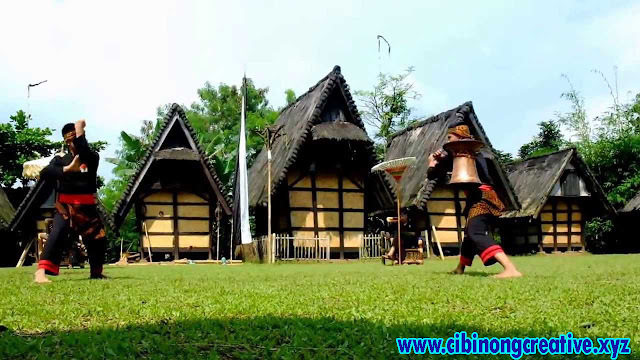 Cultural Tourism Activities which have been held in the Cultural Village Arco is purely done by the elder of the Cultural Village in order to find the cost of maintenance of traditional houses that have been built by the Government of West Java and Bogor regency and is not used for commercial purposes. 1. Operational Cultural Village, including the cost of replacing the managers, electrical, arts training, and building improvements, Noted archaeological sites and so forth. 2. Revitalization Sundanese traditional arts, among others, as captured Se'eng, Art Performance, drum VAT, gubrag Dance, Folk Art, Jason Drum, performing, comedy. 3. To show Art Tradition jaten captured Se'eng (Adu forces fighting se'eng "cooker", Tutunggulan Competition, Seminar and Cultural Activities Seren Taun Ceremony. With a visit to the cultural village of Arco means you have to help prolong the life of the buildings in the village of indigenous culture and preserve this traditional art.